That was one of the questions we got yesterday at our full day marketing workshop. It’s either this or a Facebook ad! Now…if you ask that question to someone who sells social media consulting services, or someone who specializes in direct mail or the guy that puts people into animal costumes and gives them a sign to wave at the side of the road…you can probably guess what their answer would be. 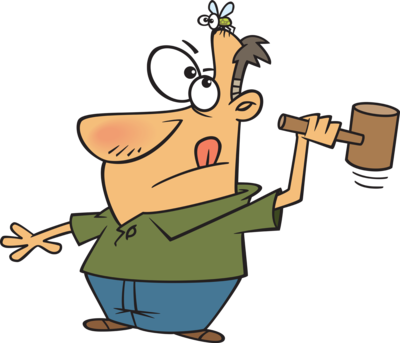 When the only tool you have is a hammer – every problem looks like a nail. Market where your clients are. This is not about reaching the MOST people – it’s about reaching the RIGHT people. Dressing up like a toothbrush and going to the local mall to hand out flyers for your dental practice management software? The BEST marketing is the marketing you actually getting around to doing. Choose activities that you’re good at (or willing to get good at) and enjoy will actually do. If you really really really don’t want to do the activity, it will be easy to procrastinate and those cold calls will never be made or the tweets will never go out or your face will never be perfectly blemish-free enough to make those videos. Pro tip: learning how to do something and getting some practice doing it can move things out of the “avoid like the plague” pile and into the “I’ll do it because my biz depends on it” pile. More about this here: how to overcome fear and build confidence. Any kind of marketing can work – and most kinds of marketing can work for most businesses. 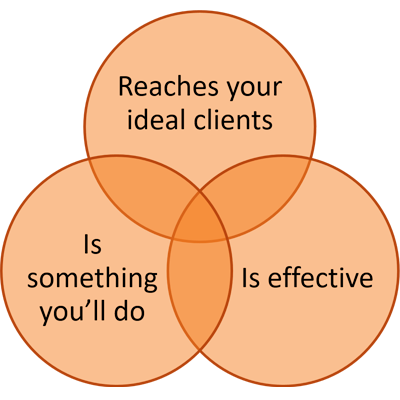 Effective marketing starts with defining who is going to buy from you and why – aka: your ideal clients and the problems you solve for them. Knowing this enables you to write clear and compelling messages that capture their attention by speaking directly to their interests. From there – the very best way to market your business is to build a complete system that works in alignment with how people make buying decisions – presenting them with the right information at the right time.